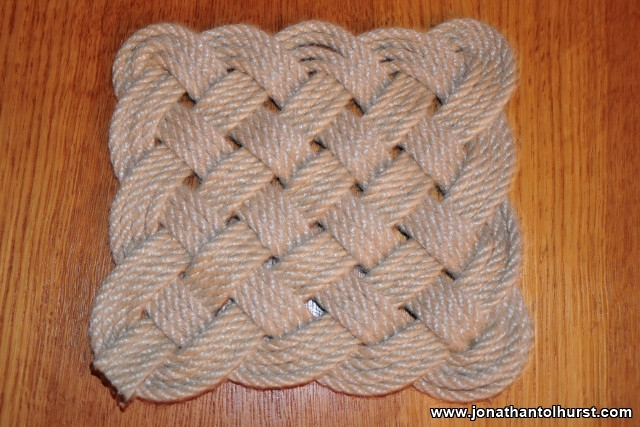 Below is my first attempt at making a “Square Knot Mat”. I used 8mm rope and made 4 passes around the pattern. It took me about 20 minutes to get it looking like in the photograph. It is possible to make the mat with a single piece of rope but I struggled to get the turn at the end of the pass looking right so opted to use separate lengths for each. Below is my first attempt at making a “Ocean Plait Mat”. I used 8mm rope and made 4 passes around the pattern. 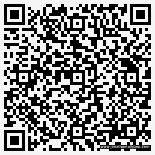 Click here to view my knots page. Below is my first attempt at making a “Carrick Mat”. I used 8mm rope and made 5 passes around the pattern. I made a second mat using the same pattern so I have a set of table place mats. Click here to view my knots page. Several weeks ago I purchased a doorstop made using the “Monkey’s Fist” knot from the Chatham Historical Dock and became rather intrigued by this decorative knot. Using the “Animated Knots” App that I purchased for my Smartphone I taught myself how to tie this knot and have managed to create 3,4,5 and 6 strand versions. The knot looks best when a ball is placed inside the knot. 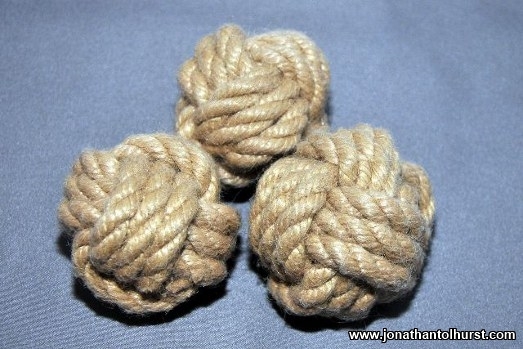 The photo below shows three overtightened “Monkey’s Fists” which make great juggling balls.